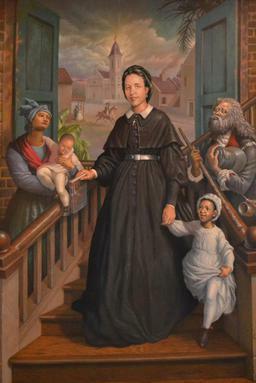 VENERABLE HENRIETTE DELILLE, 1812 - 1862 "SERVANT OF SLAVES"
did, and why she is a candidate for sainthood. Born in 1812, Henriette Delille was a real life person like you and me. She was born a free woman of color and lived her life in New Orleans, Louisiana. Henriette was surrounded by family and friends. Among Henriette's relatives was her great, great grandmother who was a slave from West Africa. Her mother and the other women in her family formed liaisons or serial monogamous relationships with white men. This means colored women "in concubinage" with wealthy white men. In recent findings, in funeral records, Henriette may have given birth to two sons who died before the age of three. She had one sister and two brothers, one of whom died in infancy. Descendants have been found and are in touch with the Sisters. When Henriette was 24 years old, she underwent a religious experience. This religious experience is expressed in a brief declaration of faith and love. On the flyleaf of a book centered on the Eucharist, is a profession of love, in her own handwriting. Written in French: "Je crois en Dieu. J'espère en Dieu. J'aime. Je v[eux] vivre et mourir pour Dieu." In 1836 Henriette drew up the rules and regulations for devout Christian women, which would eventually become the Society of the Holy Family. The group was founded for the purpose of nursing the sick, caring for the poor, and instructing the ignorant. 1842 is the date for the founding of the Sisters of the Holy Family for the same purposes. Henriette was assisted by her friends, Juliette Gaudin and Josephine Charles. Records show that these women served as godmothers to many: slaves, free, children, and adults. They also witnessed many marriages. They took into their home elderly women who needed more than visitation, and thereby opened America's first Catholic home for the elderly of its kind, as recorded in the National Register. Noteworthy are the heroic efforts of the early Sisters who cared for the sick and the dying during the yellow fever epidemics that struck New Orleans in 1853 and 1897. Because she lived such a holy, prayerful, and virtuous life, we, the Sisters of the Holy Family, wanted to present her to the world as a model of a true Christian. Therefore, we asked, from the Catholic Church, permission to begin a canonization process. Through the efforts of the late Archbishop Philip Hannan, this request was granted by Blessed John Paul II in 1988. The Church then declared her "Servant of God." The process to sainthood has four phases: servant of God, venerable, blessed, and saint. Two of the phases, servant of God and venerable, are complete. Venerable was decreed by Pope Benedict XVI March 27, 2010. Venerable Henriette Delille is the first United States native born African American whose cause for canonization has been officially opened by the Catholic Church. What remains for the process to be complete is the validation of an alleged miracle which is now being processed. If all goes well and Pope Benedict XVI issues the decree of the alleged miracle's authenticity, then Henriette will be proclaimed blessed. What follows is a glorious ceremony and celebration in New Orleans. A second miracle would be needed for sainthood. Venerable Henriette Delille lived her prayer: "I believe in God. I hope in God. I love. I want to live and die for God." Please join us in praying for her beatification. – A servant of the poor. Mother Henriette founded the Sisters of the Holy Family in 1842. Henriette Delille began serving as sponsor and witness for slaves and other people of color in the carrying out the sacramental ministry. Records of her ministry may be found at St. Mary’s Church, St. Augustine, and St. Louis Cathedral. She continued her apostolic ministry by acting as witness for marriages, sponsor for many baptisms, slave, free, adults, and children. Thus the old baptistery at St. Louis Cathedral was made into a prayer room in Henriette’s honor. The following is Henriette’s prayer that inspired her courage to found the Congregation of the Sisters of the Holy Family. Her prayer is "I believe in God, I hope In God. I love. I want to live and die for God." This information, Henrie​tte gave birth to two sons who died very young, was found in funeral records in 2004. The theologians explained that this was within acceptable limits because Henriette had not yet made her Confirmation and her life thereafter showed heroic virtue. was a slave from West Africa. The women in her family formed liaison relationships with white men. She had two brothers, one died in infancy, and one sister. Descendants from her sister and brother have been found. They are in touch with the Sisters. is the date for the founding of the Sisters of the Holy Family for the same purpose as the Sisters of the Presentation. the Old Folks Home because the Sisters took in old, sick people as soon as they began to live in community. This home continues today. Journal , this community was very poor and the Sisters made many sacrifices so that they might accomplish their mission. “I believe in God. I hope in God. To help Henriette accomplish her work, loyal lay men and women of her race established The Association of the Holy Family. They helped to build a new home for the elderly and the sick, dedicated in 1849, Hospice if the Holy Family. Henriette had personally purchased a home for the Sisters to live in community and to further their ministry. Henriette faced many obstacles in forms of social, political, and financial opposition, but she overcame them. Henriette drew up the rules and regulations for The Sisters of the Congregation of the Presentation of the Blessed Virgin Mary. They are described as “a certain group of pious women founded for the purpose of nursing the sick, caring for the poor, and instructing the ignorant. Recognized by the Church in 1841.